In the biggest public release of documents from the DOD’s propaganda office I recently received over 1500 pages of new material. Just under 1400 pages come from the US Army’s Entertainment Liaison Office: regular activity reports covering January 2010 to April 2015. Another over 100 pages of reports come from the US Air Force’s office, covering 2013. The request I filed asked for all ELO reports since the last release that covered 2005-2006 but due a variety of excuses the release was limited to these 1500 pages. The Air Force said that no documents were available from 2015 ‘due to ongoing computer outages in the Los Angeles office’. If you believe that then you’ll believe anything. While the Army documents are fully digitised and easily searchable, the Air Force ones are mid-resolution scans of printed out emails/online network files. Meanwhile, the documents between 2006-2010 (Army) and 2006-2013 (Air Force) appear to have been destroyed in keeping with the file retention policy. We already knew that the DHS only retains documents from their entertainment office for six years before shredding them like a CREEP finance report. 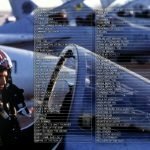 For the military it appears to be even less than that, though given the absurd excuse offered by the Air Force it is possible they have a lot more records than they are admitting to having. Nonetheless, this is the largest and most up-to-date release of documents from the world of Entertainment Liaison Offices. 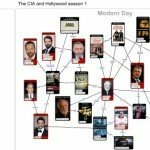 It substantially increases our knowledge of the scale and type of involvement the US military has in popular entertainment, particularly TV shows. 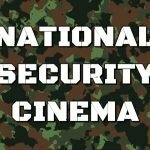 However, details of changes to films and TV shows requested by the DOD in exchange for their co-operation are conspicuously absent (no surprises there). While the name of this sergeant is redacted, the facts that she is a PSYOPS – psychological operations – specialist assigned to the Military Information Support Group at Fort Bragg is (now) publicly available information. 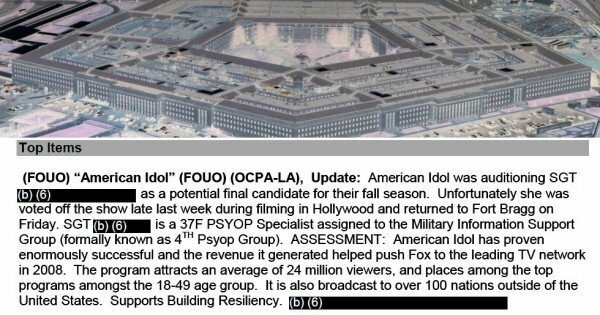 Other records about this particular project reveal that the officer made it through the the final preliminary round but missed out on being a finalist, and that American Idol film crews visited Fort Bragg to film a background VT about the contestant. As such, it must be quite easy to identify her, if anyone could be bothered going back to look at early episodes of season 10 of American Idol. I can’t. 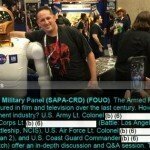 Why the DOD would be particularly concerned with being involved with a ‘documentary showcasing what it is like to work for Facebook’ when they (officially) don’t work for Facebook is not clear, but what is obvious is that the Army will push themselves into almost any show that provides a recruiting opportunity. Not to mention that their involvement in this documentary ‘supports Transforming the Generating Force’ and ‘Seeking Efficiencies and Affordability’. 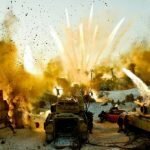 Exactly what these phrases mean, I don’t know – I am trying to find out – but what is clear that the US Army, at least, has quite precise aims in mind when engaging with the entertainment industry. Just one more piece of evidence that the domestic US population is, from the Pentagon’s point of view, no different to that of a country whose government is about to be overthrown or bombed to smithereens. This is only one branch of the US military, the Army. The Navy, Air Force, Marines, Coast Guard and National Guard all have their own Entertainment Liaison Offices. 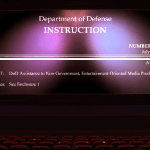 While the Army is perhaps the busiest in terms of involvement in the entertainment industry, we can be confident that the scale of the overall DOD involvement is at least double the size of what these Army documents reveal. I have filed requests with the Navy and the Marine Corps for similar reports but so far no luck. Today the Daily Mirror (technically their Sunday paper the Sunday People) published an article mentioning these documents but failing to mention my name. To be clear, I submitted the request as the result of conversations with academic Matt Alford, who pressed the Mirror into publishing the article. As per usual, you can’t trust the mainstream media to get a story straight. You can download the 1400 pages of US Army Entertainment Liaison Office reports covering 2010-2015 here (PDF) and the over 100 pages of US Air Force Entertainment Liaison Office reports from 2013 here (PDF). Update (14/07/2015): Today I received another response from the US Air Force including the 2014 activities reports and including a substantially smaller version of the 2013 reports already released to me. You can download over 100 pages of US Air Force Entertainment Liaison Office reports from 2014 here (PDF). 2nd Update (26/11/2015): I recently received 1669 pages of material from the US Marine Corps – reports going back 7 years. That actually trumps this as the biggest ever single release from the Pentagon’s Entertainment Liaison Offices. You can read about and download the US Marine Corps Entertainment Liaison Office reports here.